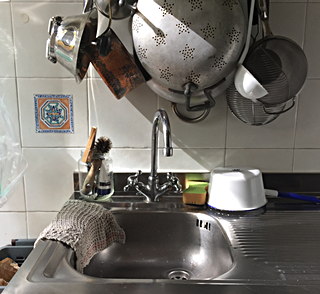 That sink is where Rachel Roddy, an English woman in Rome, prepares meals to share with her partner Vincenzo, their young son Luca, and a horde of appreciative readers of her website and, now, her first book. Five Quarters: Recipes and Notes from a Kitchen in Rome, features the sink on its front cover. That probably makes it one of the most famous sinks in Rome. So naturally when Rachel and I got home from our meeting in the new Testaccio market, it was the first thing I wanted to see. And photograph. Our conversation ranged widely, from book titles and domain names to the links between the food of Rome and the food of Manchester. And although she says she’s a romantic and prone to nostalgia, it is also clearly the case that Rachel Roddy loves learning about food and cooking, loves sharing what she’s learned, and loves telling stories. Simple ingredients, for a satisfying cookbook and website. A couple of other links. Rachel mentioned her friend Fabrizia Lanza and the farm and cooking school she runs in Sicily. Here’s what Rachel wrote recently about a wonderful idea called Cook the Farm. If you decide to follow the link, do give yourself time to pursue Rachel down all her intriguing rabbit holes.